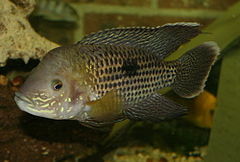 Please click on the "Inventory List" button to view all the American & New World Cichlids that are available this week. South America has at least 450 cichlid species but only 311 of them have been scientifically described. The latest complete scientific revision of this cichlid group was made during the early years of the 20th century. The South American cichlids have adapted to a wide range of environments and ecological niches. Most of the known South American cichlids are opportunistic carnivores or piscivores, but some species feed on mollusks, planktons or plant material. The smallest South American cichlid species are no larger than 3 centimeters while the largest can grow up to 60 centimeters.